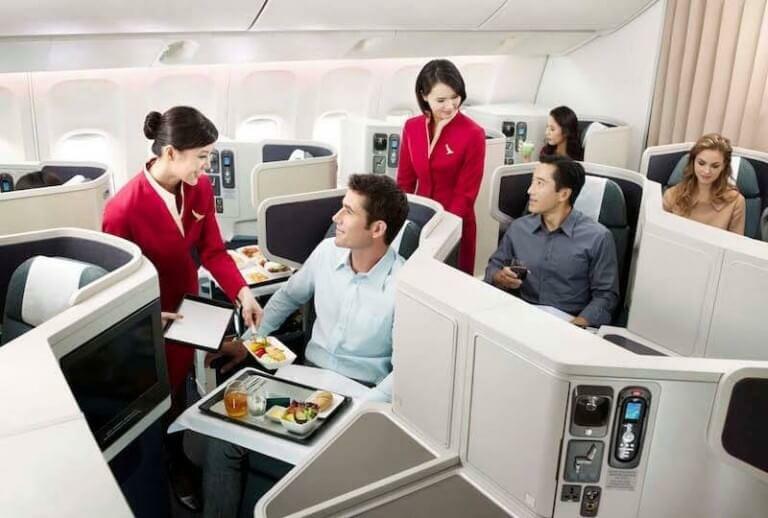 Cathay Pacific, like most Asian carriers, is known for its good service. A reverse herringbone business-class and spacious first-class suites provide some of the best award redemption opportunities for those crossing the Pacific Ocean. Cathay even operates a “fifth freedom” route between Vancouver and New York-JFK. There are a few ways to sample the carrier’s service. You can transfer American Express Membership Rewards points directly to Cathay’s Asia Miles loyalty program. Better options include booking through Alaska Airlines (Mileage Plan) and American Airlines (AAdvantage). They charge very similar amounts for award travel from the U.S. to Asia. 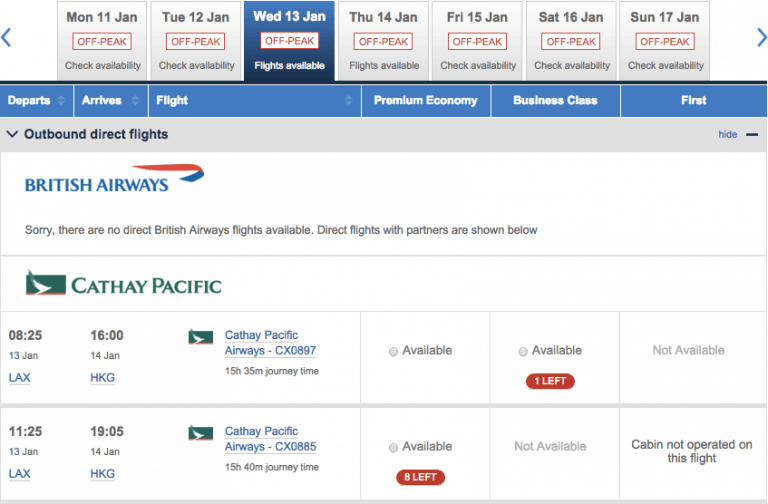 One-way award levels for travel on Cathay Pacific between the continental U.S. and Hong Kong. Alaska and American will not collect fuel surcharges on your award, and Alaska will even provide a free stopover in each direction if you want to spend some time in a second city on the way. Surprisingly, Alaska Airlines charges the same price for a first-class award from North America whether you visit Hong Kong or South Africa, even though you’ll pass through Hong Kong on the way to the latter. Neither program displays Cathay Pacific award space on its website, so you will have to search elsewhere. Two of the best resources happen to be the British Airways and Qantas websites. You should create an account with either program. Don’t be scared off by Qantas; although it claims to charge a fee for new members, this only applies to residents of Australia and New Zealand. A good strategy will be to search for a non-stop flight to Hong Kong from one of Cathay’s eight gateways in the U.S. and Canada. These include Boston, Chicago, Los Angeles, New York (EWR and JFK), San Francisco, Toronto, and Vancouver. Only then should you look for connecting flights on either end. Keep in mind that when connecting onward throughout Asia, American Airlines will permit flights on Cathay’s regional subsidiary, Dragonair, as well as various oneworld Alliance members. Alaska Airlines, however, will only permit itineraries that include Cathay Pacific and itself. Using British Airways, login to your Executive Club account and begin a new search from the left sidebar. 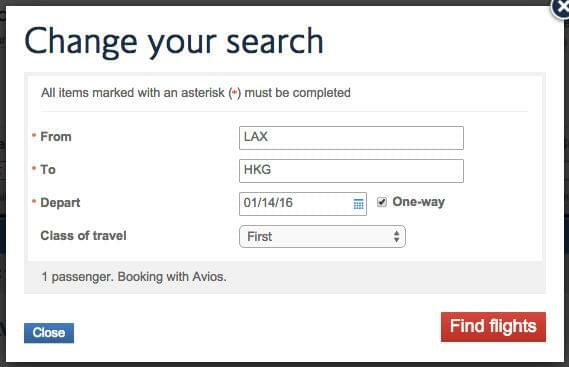 Remember to change the payment type to “Book with Avios.” British Airways displays award space in only three cabins at a time, including premium economy, so you’ll also need to select “first class” if this is your preference. A few bugs sometimes prevent changing the cabin class on the first try or incorrectly switches between U.S. and international date formats. You may have to repeat the search on the results page. During the search you will be asked if you want to include a stopover. Refuse this option, as it will attempt to route you through London. Still, British Airways is very helpful when booking a group because it often (not always) displays the exact number of seats remaining in each cabin. Ignore the cost and the peak/off-peak distinction. The real cost will be determined by the loyalty program that you actually use to book the award. 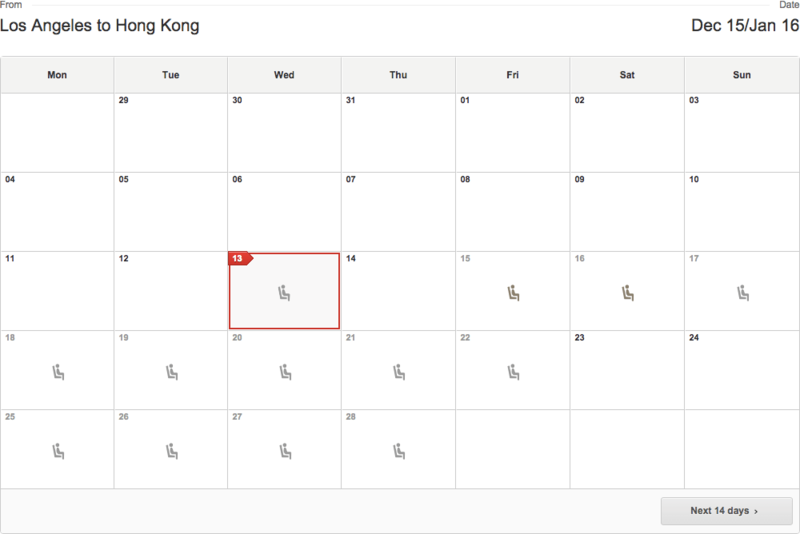 Qantas is a good choice when you require a calendar that can display a month of results at once. Cathay Pacific releases limited award space in advance, so a good strategy might be to book something—anything—and change the award close to departure. Business class will begin to open up in the last few weeks, and first class in the last few days. Your first search will only return economy class, so check the boxes at the top for business and first class, respectively, and update the results. 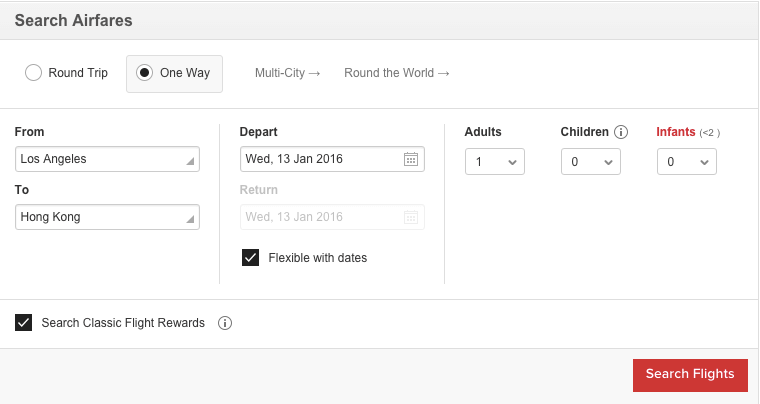 Either you’ll find a few lucky dates, or the page will default back to economy class. At this point you can usually go back to the British Airways website to determine the exact number of seats and search for connecting flights. However, one advantage of using Qantas is that it displays award space on Alaska Airlines. You should be looking for nonstop travel anyway (always add connections later), but if a connection is required within the U.S. then you are more likely to find it with Qantas. British Airways does not display any Alaska Airlines award space. Once you find all the segments you need, call American Airlines (1-800-433-7300 anytime) or Alaska Airlines (1-800-252-7522, 5:00 a.m. to midnight PST) to book the award. Although neither carrier collects a fuel surcharge, Alaska will impose a partner award fee of $12.50 per person each way. A word of caution: American Airlines will soon raise the cost of award travel on many routes if booked on or after March 22. This means that AAdvantage members who find and book award space before this deadline could save thousands of miles, especially for business- and first-class travel. In the example of Los Angeles to Hong Kong used in this post, new one-way prices will be 70,000 miles for business class and 110,000 miles for first class. If you can’t find award availability on the exact dates you want, American has confirmed that its members will be able to change a reservation to new dates after the devaluation. You will not pay any additional miles as long as you keep the same itinerary.